Never having read this series before, I was curious to see if this book would work on its own, and whether information would be presented in a way to keep the major players in the story identifiable. The relationship with Lucie and Quinn did take some adjustment to understand their dynamic, but the characterizations are so present that it wasn’t long before that dynamic was presented. Plenty of other secondary characters, sure to be familiar with those who have read the series, presented themselves, and understanding everyone’s roles and relationships to the plot and one another did take much (if not all) of the book, and unfolded in ways that made sense. The villain in this story was wonderfully complex with his fingers in many different subplots, all coming clear at the very end. Intermixing history and the politics of the Harding era was a nice touch that helped to set both the reasons and a depth to the feud that made sense, and had me continually engaged. Not over-dramatized or laced with red herrings to increase readers’ tension, the story was reasonable in pacing and never had moments of “oh get on with it” that interrupted the flow. Truly intriguing with plenty of characters that I am curious about and would like to see more of (Hope being a particular favorite) I’ve added earlier titles in this series to be read during my leisure time. 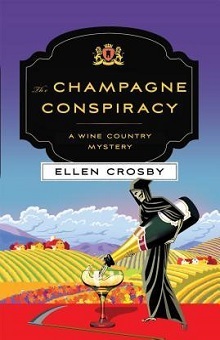 ELLEN CROSBY is the author of the Virginia wine country mysteries, including THE CHAMPAGNE CONSPIRACY, her most recent book, featuring vineyard owner Lucie Montgomery, as well as MULTIPLE EXPOSURE and GHOST IMAGE, which feature international photojournalist Sophie Medina, and MOSCOW NIGHTS, a standalone mystery. Previously she worked as a freelance reporter for The Washington Post, Moscow correspondent for ABC News Radio, and as an economist at the U.S. Senate.